Help CenterHelp for Interfolio DossierHelp for Your Dossier Dossier Deliver: Create and Send Deliveries of Your Dossier Materials About: "Email Delivery vs. Confidential Letter Upload" What's the Difference? This article explains the difference between email deliveries and confidential letter uploads. Both delivery types are available with an upgrade to Dossier Deliver. Email deliveries are for sending your Dossier materials to an email address that is authorized to receive application materials for a specific position or search. You can send any of the documents in your Dossier using an email delivery, but for confidential letters of recommendation, we ask that you provide a link to a website or text description with information about the opportunity to which you are applying. This is so we can verify the destination, and ensure the security and integrity of your confidential letters. See here for more information on sending Dossier materials via email. Confidential letter uploads are for sending confidential letters of recommendation to online application systems. 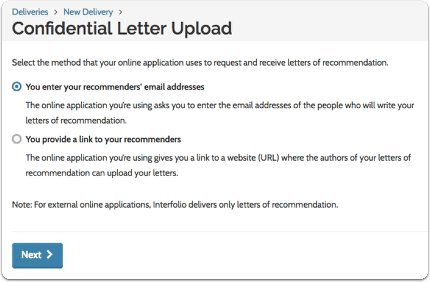 This delivery type allows an applicant to upload a confidential letter to an online application platform. When you are filling out an online application form, you may be asked to enter the email addresses of the people who will write your letters of recommendation, or the online application may give you a link to a website (URL) where the authors of your letters of recommendation can upload your letters. In either case, we can upload confidential letters from your Dossier account to these systems. See here for more information on confidential letter uploads to online application systems. Interfolio-hosted Position – The receiving institution is using Interfolio to manage their search. 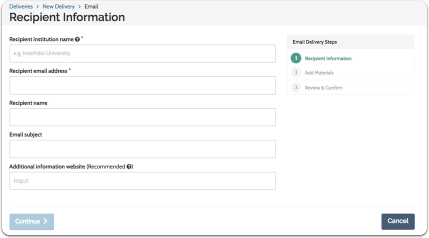 All deliveries to Interfolio-hosted positions are free for Dossier users and do not count towards your 50 annual deliveries.